I make hummus all the time. But I've only just managed to post this because taking a picture of it looking super lush, rather than a mass of mush, is easier said than done. I'm quite pleased with this shot – some of my other efforts, using peppers or cucumber, looked like something from a bad 1970s dinner party. I haven't always made hummus. For years, I was strictly a readymade kind of girl, but since reading Joanna Blythman's excellent book on the food industry, Swallow This, I've been looking at ways to reduce the amount of processed foods I eat, however healthy they might otherwise appear. 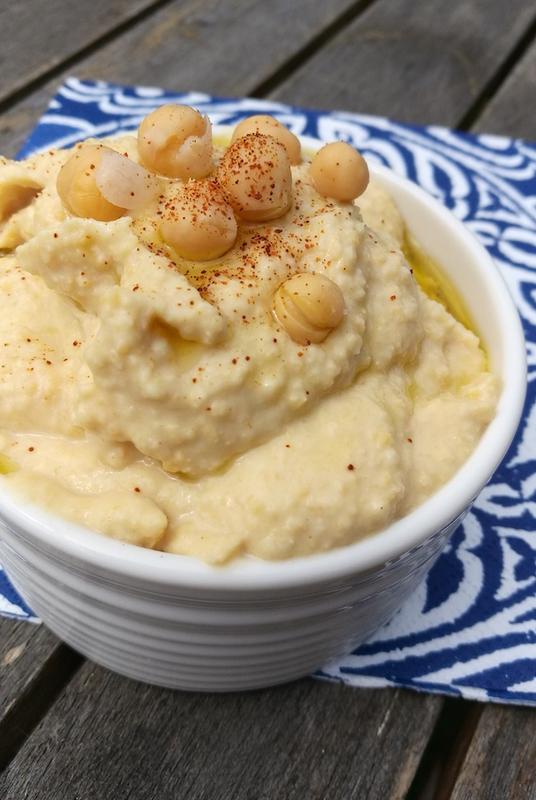 So, homemade hummus it is. The trick is lots of water in the mixture, and a good helping of lemon too. This gives you the moussy texture and lovely tang, in contrast to the rather earthy chickpea flavour. Don't forget a little garlic and salt. This really couldn't be easier. Just pop all the ingredients in a food processor/blender and blend for a minute or so until it's smooth. You might need to give it a little stir, then blend again for a few moments. Store in an airtight tub in the fridge. * Obviously there would be even less processing if you used dried chickpeas instead of canned, but I'm fairly last-minute so rarely get round to doing this, despite all my best intentions. You need 125g dried chickpeas soaked overnight in plenty of cold water. Next day, place in pan and cover with water. Boil for 10 minutes, then reduce to a simmer for 40 mins until tender. Drain and allow to cool.